Soybean acreage is continuing to expand west into Saskatchewan and Alberta. Many growers already grow glyphosate-resistant canola in rotation and are adding glyphosate-resistant soybeans as another crop in their system. However, managing glyphosate-resistant canola volunteers in glyphosate-resistant soybeans is a challenge. RR canola in RR soybean trials at the University of Saskatchewan in 2014. Soybean acreage is continuing to expand west into Saskatchewan and Alberta. In the first research studies, Willenborg looked at using pre-emergent herbicide treatments alone and post-emergent herbicide treatments alone for control of volunteer canola. Building on those results, the most recent study focused on combined pre- and post-emergent treatment strategies. The combination study compared three pre-emergent product treatments: 2,4-D Ester, tribenuron (Express SG) and saflufenacil (Heat). Five post-emergent products were also compared: bentazon (Basagran Forte), bentazon plus imazamox (Viper ADV), chloransulam-methyl (FirstRate, FirstRate plus Express SG), thifensulfuran (Pinnacle SG) and fomesafen (Reflex). Willenborg emphasizes that the trials included chemistries currently registered for use in Western Canada as well as some products that are so far only registered in Eastern Canada for soybeans, such as FirstRate. Reflex is only registered for use in Manitoba’s Red River Valley. Chloransulam-methyl (FirstRate) is not registered in Western Canada. Willenborg notes that overall, the highest net return was typically observed in the Pinnacle SG plus FirstRate treatment, however this combination is only registered in Eastern Canada. 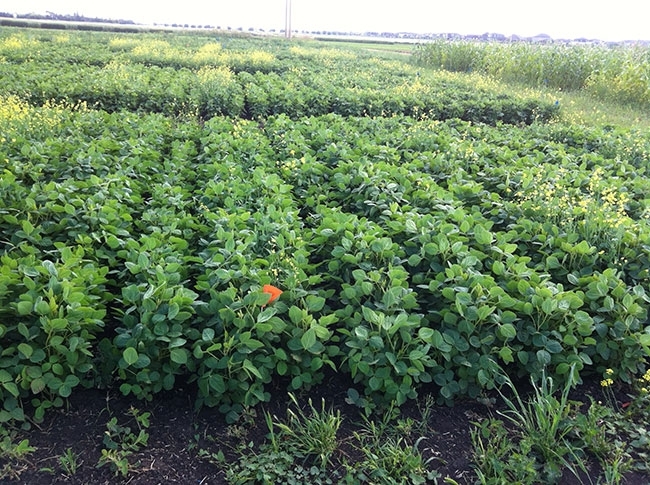 Although the Reflex treatment was effective, the phytotoxicity ratings were above acceptable thresholds seven to 10 days after herbicide application, leading to potential injury to soybean seedlings. “We also did not see the results we were looking for with 2,4-D pre-emergent treatments,” he adds. “We observed some injury with 2,4-D treatments using the seven day interval between application and planting, which indicates a longer interval will be required in Western Canada, or this treatment will not work well in our conditions.” Overall, the Pinnacle SG treatment had the greatest amount of volunteer canola shoot biomass present following application. The results of the seeding rate component of the study, which included a small economic analysis, showed that higher seeding rates resulted in higher soybean biomass and yield and lower volunteer canola biomass and seed contamination. The optimal seeding rate was 40 plants per square metre (/m2) in years with lower than average market prices, but in years with higher market prices increasing seeding rates to about 50 to 60 plants/m2 was recommended. Willenborg emphasizes that higher seeding rates increase crop competition and decrease the contribution of volunteer canola seed to the seedbank, which pays future dividends down the road. However, if the market price isn’t high enough, then it doesn’t pay to use higher seeding rates.